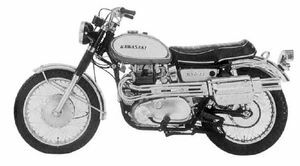 The Kawsasaki W2 is a 650cc, twin cylinder, four stroke, street motorcycle manufactured by Kawasaki from 1968 through 1970. Japanese motorcycle manufacturer Meguro purchased their motor and transmission assemblies from Kawasaki Heavy Industries. 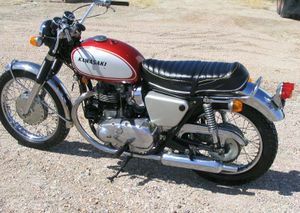 Kawasaki eventually purchased Meguro in the early 1960s and inherited this motorcycle design. 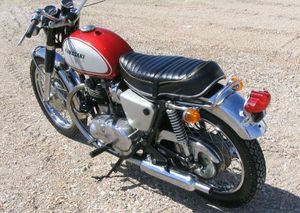 Influenced greatly by the BSA A7/A10 series twins, it was extremely well constructed and was one of the first large capacity machines to come out of Japan. 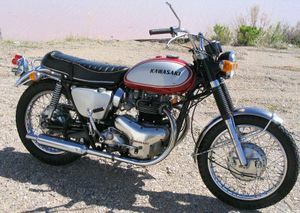 Looking much like a Triumph Bonneville T140 or BSA Thunderbolt, the styling gave way to an updated Kawsasaki line of two stroke motorcycles which sold very well. Remarks: Developed version of the W 1SS. Performance upgraded, and instruments separated from the headlight housing. 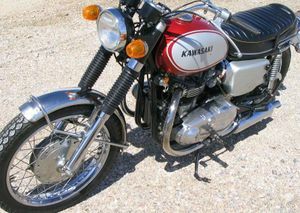 The Kawasaki W2TT used a dual exhaust system which was located on the left side. This gave the W2TT the appearance of a Tourist Trophy bike. 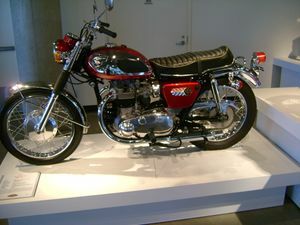 Remarks: Touring version of the W2TT. 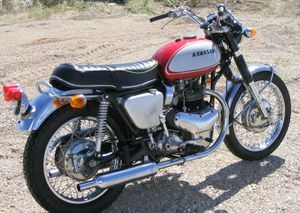 Can be identified by the twin mufflers on the left.